Recently I was working on a project with @SQLDusty (Dustin Ryan) and we were upgrading some projects from SQL Server 2012 to 2014. One of our script tasks that we were using to dynamically create and process cube partitions was failing. The worse part is that the error message was completely generic so it wasn’t immediately apparent what was wrong. After a little troubleshooting we were able to find the root cause and solve the issue. The problem that we had was that our .net reference for Analysis Management Objects was 11.0 (2012) and it needed to be 12.0 (2014). 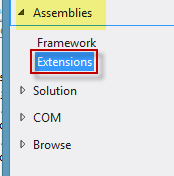 Here is a screenshot of the .net reference as seen in the solution explorer. This screenshot of the properties window displays the version number for my .net reference. Also pay close attention to the Description box. 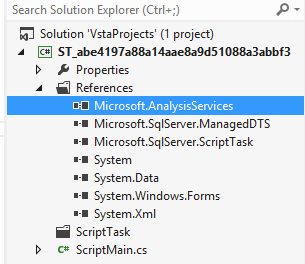 This description is what you actually look for and add when adding the Microsoft.AnalysisServices reference to your script task. So now all we need to do to fix this problem is remove the current reference and add the correct reference back in. 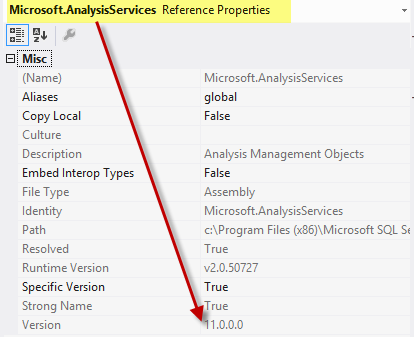 3) Finally select Analysis Management Objects 12.0.0.0 as seen below and add it to your references. This fixed our problem and if you are also going through the upgrade process I hope this helps you as well!